Foreign trade zones (FTZs), sometimes referred to as free trade zones, are designated areas in the U.S. where goods can land and be modified, relabeled, stored, etc., then exported without U.S. customs authorities getting involved. These zones are useful to companies that import high volumes of components, raw materials, or parts from other countries, and then use those parts to manufacture a finished product that is eventually sold to customers abroad. The zone allows them to avoid paying duties on the imported parts. A foreign trade subzone is an area outside the FTZ and is approved for use by a specific company. There are more than 230 foreign trade zones and almost 400 subzones in the U.S. Here’s the full list of Foreign Trade Zones by state. According to the International Trade Administration (ITA), the largest industry currently using zone procedures is the petroleum refining industry. Significant zone manufacturing also occurs in the automotive, electronic, and pharmaceutical product areas. In far northern California, we have two approved zones, one in Eureka and another in West Sacramento. (Continuing south, you find FTZs in San Francisco, Oakland, San Jose, and beyond.) The number of companies currently utilizing our two Norcal FTZs is small. In Eureka, there are currently no firms leveraging the FTZ. In the Sacramento area, two large manufacturing companies–one producing carbon fiber and the other producing high-resolution monitors–have created their own subzones to take advantage of the benefits offered by the West Sacramento FTZ. According to CalChamber, the purpose of the FTZ is to stimulate the economy by, among other things, creating jobs. Other direct benefits to the manufacturer include cost savings, reduction of customs duties, duty exemption, and deferring customs duties until a buyer is in place. 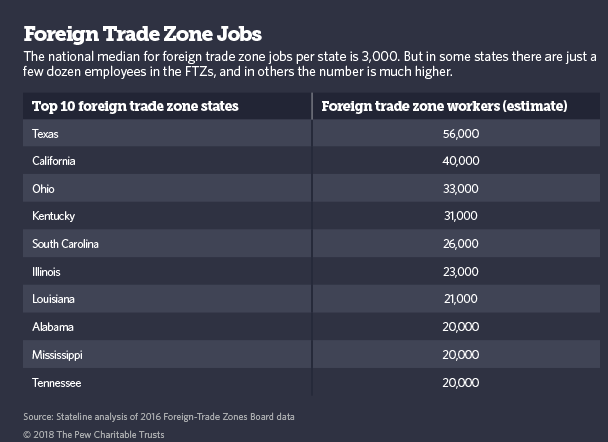 Some cities have used the establishment of FTZs as an economic development tool, as a way to lure new companies to the area and boost the local job count. Limon, Colorado, is an example. Situated 90 miles from Denver, Limon’s city officials are hoping to attract large warehouses to their town of 2,000 people with their FTZ designation. Recent history has seen a steady decline in the utilization of FTZs. In a 2016 Stateline article, it was reported that about half the 80 zones created in the prior two decades didn’t have a single company using them in 2016. But things are beginning to change. As the push for a return of manufacturing jobs to the U.S. intensifies, there may be more companies seeking the advantages a FTZ offers. Is it worth it for a small or medium sized business? According to FTZ experts, establishing a Foreign Trade Subzone is usually for large manufacturers who are importing tremendous amounts of raw materials. More often than not, it doesn’t make financial sense for a small or medium sized business to sign on. However, if you’re curious about the cost savings you might get for your business with a FTZ, use the ITA’s Duty Savings Estimator to find out. If you’re interested in learning more about an FTZ near you, visit Eureka FTZ or West Sacramento FTZ.